Summer Berry Puff Pastry Squares are a fantastically light treat to enjoy with your family. Crisp, buttery puff pastry is topped with fresh whipped cream and seasonal, naturally sweet berries. No better way to treat yourself on a hot, summer day! Childhood memories of summer always take me back to our family’s typical weekend beach day. We would get up early and hop right into our swimsuits. My mom would pack us and all the beach gear into the minivan. A thirty minute drive east (with the occasional stop at Dunkin Donuts or 7-11 if my brother and I were lucky) and we’d pull into the huge parking lot at Seven Presidents Beach in Long Branch, New Jersey before the crowds hit. The thing I remember most about our beach days, hands down, is boogie boarding. My brother, being older, was always the pro. I did not DARE touch his precious, pristine boogie board. Oh no. He kept that thing spotless. I don’t think it even ever touched the sand, he took such good care of it. Me? I took a much more laid back approach to the sport of boogie boarding. Most of the time you would probably find me sitting on my boogie board near the edge of the water, letting the tide bury my feet in the sand. After a long day in the sun, we would stop on our way home to pick up some fresh corn at a farm stand on the side of the road. Shucking the corn was my job. I HATED it. All those pesky little strings. But it was worth it for the perfect summer dinner. (At least I feel that way now…) Chicken or burgers on the grill, fresh corn, and green beans from our garden. Nothing fancy, but it was the best. Sometimes my mom and I would make a dessert. I would get so excited when she pulled out the package of sponge cake dessert cups from the grocery store. Do you know what I’m talking about? They probably are full of trans fat and a million weird ingredients but I loved those things. We topped them with Cool Whip and fresh strawberries. It’s probably been about 20 years since I’ve had one! Pastries can be finicky, but using pre-made puff pastry dough means even the worst baker can handle these. Though the dough is store-bought, you would never know. It is perfectly flaky and buttery — everything puff pastry should be! I beg you to make this lightened up whipped cream. I originally saw the idea to add greek yogurt to whipped cream in Cooking Light. This was my first time trying the technique, and I was pleasantly surprised! Whipped cream only takes a few minutes to make and is SO much better than store-bought. Adding a bit of powdered sugar, vanilla, and lemon zest makes it especially delicious! 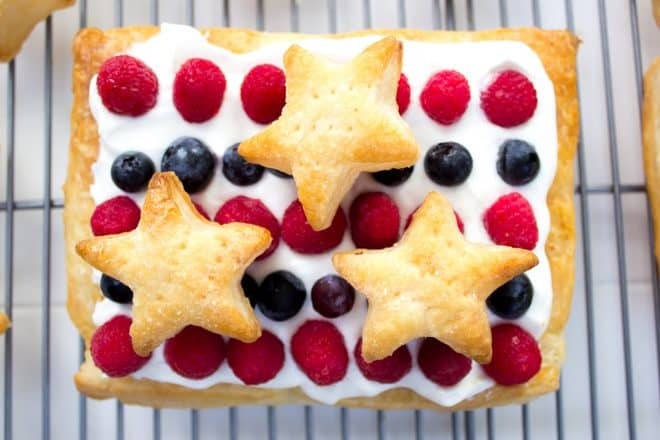 I topped the pastries with stars, just for fun, since it’s almost 4th of July. Instead, I recommend you top yours with a dusting of powdered sugar over the berries, then cut each piece into 4 for serving. Fresh and light Berry Puff Pastry Squares are the answer to this summer's backyard BBQ. Don't you dare skip the lemon zest - it takes these treats to the next level! Line a baking sheet with parchment paper. Preheat oven to 425 degrees F.
Unfold the pastry and cut into 4 rectangles. It comes folded up in 4 rectangles so you will just slice it along the seams when you unfold it. Alternatively, you can cut into 16 rectangles here. I preferred making larger pieces and then cutting to serve, but you can cut them into individual servings at this point too. Transfer to the prepped baking sheet. Prick the pastry several times with a fork. Then chill the pastry in the fridge for 10-20 minutes. Lightly dust the pastry with powdered sugar. Bake until golden brown and risen. Make sure it is nicely browned, because if it's not baked long enough it will fall when it cools. If you cut the pastry into 16 smaller rectangles instead of 4 larger ones, you'll want to check them sooner than 15 minutes. Check on the pastry by turning on the oven light so you don't have to open the door several times. Cool on a wire rack when done baking. A few hours before baking, put your metal mixing bowl in the freezer to chill. In the bowl of the mixer (fitted with the whisk attachment), add the cream, greek yogurt, powdered sugar, and vanilla. Whisk until soft peaks form. Add the lemon zest and fold in with a spatula. Spoon whipped cream onto pastry sheets, dividing evenly between each. Top with berries in rows, alternating raspberries and blueberries. Dust top with powdered sugar. Slice each pastry into 4 rectangles and serve. Enjoy within 2 hours of baking. Otherwise the pastry will lose its crunch (the best part!). Halve or 1/4 the recipe for a smaller group. The pastry does not keep, so you are better off leaving extra in the freezer for another day than baking it all at once if you won't be eating it all at once.